This winter as homeowners worry about ice, snow, and roof leaks, many homeowners turned their thoughts to a metal roof. Smooth and indestructible, metal roofs allow snow to slide off easily, avoiding many problems caused by ice that backs up under asphalt shingles, melts and drips into the house. Other homeowners value metal roofs because of their environmental advantages. They are made from more than 90 percent recycled steel or aluminum. One company boasts that 11,000 soda cans make up a 10-by-10-foot roof section. The metal roofs last longer, and when they are replaced, instead of adding tons of asphalt shingles to landfills, the roofs can themselves be recycled. But there's a significant obstacle: A metal roof is more expensive than asphalt shingles, although the costs are comparable if the price of the metal roof is prorated over its useful life. Metal roofs last over 50 years and do not leak, so in the long run, they are less expensive. If you are thinking long-term, metal roofs are more expensive, but once they are installed, they are done. You never have to touch these roofs again. There is an additional benefit of metal roofs that you may like as well, another roof won't end up in the landfill. A metal roof carries a lifetime guaranty, which means they never need to be replaced. Metal is more expensive, but on the other hand, asphalt has a shorter life. You have a high outlay initially, but you get it back over the years. A lot of people are fed up with water in the house and ice dams and may seek a metal roof alternative before the winter. Metal roofs can be made of steel or aluminum, but aluminum is used exclusively in coastal areas or where humidity levels are high. Styles vary, from the traditional New England barn look of standing flat seams to realistic imitations of slate or shingles, tiles or shakes. Many are finished with a durable paint guaranteed not to fade, or a Teflon material. Warranties vary and are usually transferable but are often limited to the first transferee, and are limited in time. For more information on metal roofs, contact SB Roofing. Here are some tips on how to choose a contractor for a new roofing project. One of the biggest mistakes people make is automatically going with the lowest priced contractor. Too many people base a job off of a price. Instead of choosing the lowest bid, check to see how long the companies have been in business and finding out what former clients have to say about each one. Check to see if the contractor offers a warranty. If you pick a certain contractor who has the certifications, they’re able to give you a warranty that basically covers a roof against any defects as long as the person owns the home. An established roofing company can more likely ensure they will be there if a warranty needs to be used, while shingle companies are less likely to certify a “pick-up truck roofer” to give these kinds of warranties. Try to find out why a bid is low before choosing it. A low bid can indicate poor quality materials or work, but it also could indicate that the contractor has low overhead expenses, thus being able to offer services at a lower cost. Find out the reputation of the contractors and that people can always ask the them how they arrived at their bids. One way of finding out some information on contractors is by calling a local roofing distributor and asking them who’s one of their biggest clients as far as purchases go. Also, ask the companies for references, as quality companies typically will be happy to put a potential client in contract with a past customer. Checking to ensure that the roofing company is licensed and insured is something else to look for when choosing a contractor. You need to make sure whoever you’re hiring has the proper workman’s compensation insurance and have it faxed or e-mailed directly from the insurance company so you know it’s legitimate. As far as do-it-yourself roofing jobs, a professional job will typically always yield better results. For those considering a new roof, September and October are the best months of the year to have it done. Contact SB Roofing for more information. Attention Active Military, Veterans, and Retirees. SB Roofing along with GAF Roofing systems would like to Thank you for your sacrifice and your commitment. GAF – a U.S.-based corporation – is giving back to our troops. Receive a $250 rebate off your Lifetime Roofing System when installed by a GAF Factory-Certified Contractor! Professional installers have long preferred the rugged, dependable performance that only a GAF roof can offer. The Timberline Shingles with Advanced Protection are the #1 selling shingle brand in North America! In fact, they are rated #1 in shingle quality by U.S. contractors and home builders. The Roofing System must be installed by a GAF Factory-Certified Contractor like SB Roofing by December 31, 2014. The rebate form must be received by January 31, 2015. Besides performing the essential function of protecting you and your belongings from sun, rain, hail, and snow, roofs come in various shapes that add architectural interest to the buildings they cover. Factors to consider when choosing a roof, and roofing materials such as roof shingles, are local climate, cost to build and maintain, and the style of your home as a whole. If you are actively planning to build a house -- or just daydreaming about your future residence here is information on the different roofing styles. A flat roof is the simplest kind to build. It takes the least amount of roofing material but needs to be carefully waterproofed, because it doesn't drain well. If you'd like to relax on a glamorous terrace or plant an eco-friendly urban garden atop your roof, a flat design could be for you. A shed roof consists of a single plane, which is slanted, high on one side, low on the other. This is an improvement on the flat roof due to better drainage. Although it will leave you with odd-shaped rooms underneath, adventurous souls may plan this deliberately as a unique architectural feature. A gable roof has two sides that slope down from a central ridge. Easy to build and suitable for whatever climate you may live in, it can be vented and doesn't collectprecipitation or debris like fallen leaves. The gable roof allows space for an attic, great for insulation purposes; you'll find it less complicated to insulate the floor of an unheated attic space (which can be used for storage of non-cold sensitive items) than the roof itself. A hipped roof has two long sides and two shorter ones slanting down from a ridge in the middle. The eaves can overhang your property, shading overly sunny windows and shielding the entrance, as well as protecting siding from rain. With its high-quality wind resistance, the hipped roof is ideal for warm climates where there a frequent rainstorms. It's an excellent Miami roofing choice, for example. A pyramid roof is similar to the hipped variety, with the difference that the former is topped by a sharp peak instead of a flat ridge. A mansard is also a variation on the hipped roof theme, with four sides. There are two slopes to this elegant roofing type, with a lower slope that is much steeper than the upper and contains dormer windows. If you'd like to maximize your usable living space, this design will allow for an additional story under the roof. A gambrel roof resembles the mansard, except its short ends are vertical gables and it juts out over the faade of the building. A bonnet is a pyramid roof modified to offer more shade to your home's outdoor area. Two of its sides change pitch partway down, from a steep slope to a gentler one, and stretch out to form large eaves. A curved or, even more dramatically, an arched roof is a striking architectural feature, which may be used to cover your whole house or just a very visible portion. It provides good drainage and is usually manufactured from steel for maximum strength. Most outstanding of all, a domed roof will add an exciting finishing touch if you are planning an over-the-top luxurious property. Construction is costly, though, compared to other roofing types. For more information on choosing the right shingles for your roof, contact SB Roofing. Your roof keeps your home safe and sheltered from the elements, but it’s one of the most expensive items to replace on or in your home. This is why it’s so important to shop around before signing on the dotted line with a roofing contractor. No matter what type of home you live in, the price to replace a roof can be all over the map regardless of if it is damaged or old age. You can find prices ranging from $5,400 to over $20,000 for the same roof for the same work. High pressure sales tactics aren’t uncommon with roofing companies. By getting multiple bids you really increase your chances of getting a low price, of saving thousands and thousands of dollars. By the way, you have three days to cancel any home improvement contract when that contract is signed in your home. If you’re looking to replace your roof, get at least three estimates. It is also important to ask around, and check reviews. SB Roofing specializes in a variety of roofing systems. Whatever your needs, we have a solution. Our roofers are qualified to install or repair many styles of roof. All our work is backed by a Quality Workmanship Warranty/Guarantee. For more information on roof repairs and roof replacement, contact SB Roofing. Roofing shingles can be made from many materials, including wood, metal or thin pieces of overlapping slate. But far and away the most popular material in the US is asphalt shingles. The reason is they’re easier to apply, they’re relatively inexpensive and, when installed correctly, they can last decades depending on the slope of the roof. Many weather issues can cause shingles to come off of your roof. It’s hard to speculate what might cause this to happen. Once the underside of the shingles is exposed to the wind, the lifting and tearing force can easily defeat the roofing nails that hold the shingle in place. Modern shingles come with self-sealing asphalt cement designed to interlock the bottom of each shingle with the one below it. If the missing shingles are on a steep north-facing side of your roof, it is possible this sealing compound never got to activate as well as it should have. When the sun’s rays hit shingles, it heats them up, causing the self-sealing compound to activate. In most situations, this compound does a magnificent job of welding the shingles together. The roofing nails that hold in the missing shingle or shingles in place may not hold well for a host of reasons. Maybe the nails were not long enough. If you can gain access to the attic space below the roof where the shingles are missing, inspect the roof sheathing to see if it’s rotten, has cracks or is soft. If you have shingles that have blown off your roof, ask at least two independent roof inspectors to come out and give you an opinion. If you tell them you just want them to look at the roof, you could get a significant discount on the fee. If you it is decided that your existing roof is in good shape and you can have the missing shingles replaced or you can choose a whole new roof. For more information on roofing materials and roof inspections, contact SB Roofing. category by the Virginia Beach Award Program. SB Roofing is dedicated to providing quality products, craftsmanship, and service. But, more importantly, we want to assure that you are completely satisfied with the job we do for you. Various sources of information were gathered and analyzed to choose the winners in each category. 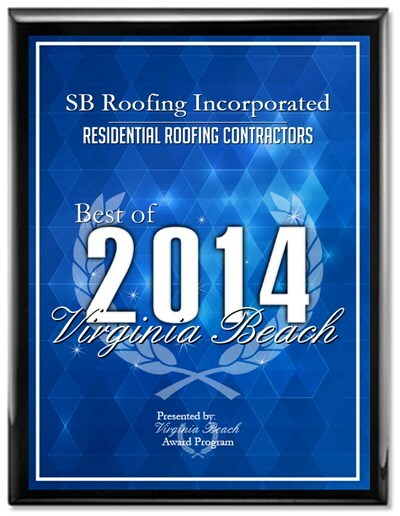 The 2014 Virginia Beach Award Program focuses on quality, not quantity. Winners are determined based on the information gathered both internally by the Virginia Beach Award Program and data provided by third parties. For more information on SB Roofing, contact us. Spring is here. If you need a new roof after the tough winter, you know that this is one of the most important, and biggest, investments you can make in your home. That’s why it is so important to hire a knowledgeable roofing contractor. In fact, choosing the right contractor is just as important as choosing the right roofing materials. Remember the four “R’s” to help ensure you have the best person for the job. A great roofing contractor for your new roof should be dedicated to outstanding craftsmanship and should have a high level of professionalism. Ask for referrals from friends and family or check out reviews on consumer rating sites. As a general rule, any contractor you consider should be in good standing with the Better Business Bureau and hold at least $1 million in general liability insurance. Make sure to verify that he or she carries all required state and local licensing. As with any other professional service, it’s also a good idea to “shop around” and obtain multiple quotes before making a commitment. After a prospective roofing contractor does a thorough roof inspection, they should provide a written proposal and cost estimate for your roof replacement project. Review the proposal closely and inquire about such details as projected start and completion dates, expectations for payment and adherence to local building codes. The proposal also should clearly outline the scope of work for the job – including all products to be specified. In addition, this is an ideal time to ensure that the contractor will commit to supervising the job during each phase of the work, inspect it thoroughly when finished and leave your yard in the same shape it was found. Consider selecting a contractor who provides additional roof warranty coverage for excellent protection. Make sure your contractor takes the time to explain all available warranties so that you thoroughly understand the limitations and requirements before your roof is installed, and you know who to contact if there’s a problem in the future. It’s important to make the extra effort to find a roofing contractor who will provide the support, know-how and breadth of services necessary to install a beautiful new high-performance roof for your home. For more information on SB Roofing, contact us. Metal roofs are a popular option among homeowners and landlords because of their durability, strength and attractive appearance. Metal roofing offers great value because it has a longer lifespan than traditional roofing materials. With proper maintenance and optimal conditions, metal roofing will cover a building almost indefinitely. While shingles will need to be replaced regularly, metal roofing offers you style with savings. Here are some things to consider when shopping for a new metal roof. Metal roofs are no longer synonymous with shiny tin roofs. These days, metal roofing has many styles and colors; matte finishes and textured designs in every color. It's all about functionality and making a design statement. Find a style that will match the architecture of your building. Choose a handful of textures and styles, and request samples to see how they will look against your brick or siding. Metal roofing comes in a variety of materials, including steel, aluminum, copper, zinc or an alloy of multiple metals. There are also varying grades and thicknesses. Some materials have longer lifespans and are suited to regional weather variations. You can choose between different stages of pre-fabrication. Some styles come press-formed and full-painted while others require more on-site work. It's important to get advice from a company you trust, one with deep roots in your community. Local companies will understand which materials and brands perform best for your area. Be sure to do business with a company that has a long track record of happy customers. As with any product you purchase, it is important to understand what the warranty covers. Also, look to see what problems the warranty will cover and whether there are any out-of-pocket costs for materials, labor or both. A properly designed and installed metal roof can help you save money on your energy bill. Compare different materials and styles for any factors that will provide energy efficiency. Some metal roofs can include insulating underlayment and special reflective coatings to deflect solar radiation. These materials can keep your attic cooler in the summer and warmer in the winter, thus reducing your energy consumption. Many homeowners do not put too much thought into their roofs. But when leaks develop, roof repairs and the costs involved shed light on how important it is for homeowners to pay closer attention to the roofs over their heads. Though certain roof issues, like lost shingles due to weather, are unforeseeable, many problems can be avoided with routine roof inspections. Checking roof conditions twice a year can help homeowners avoid potentially costly repair work or even more expensive roof replacement. Spring is a good time to inspect roofs. Bad weather, ice and cold winds can do significant damage, making spring the perfect time to find out if you had any roof damage over the winter and address any issues. Start the roof inspection in the interior of the home, pinpointing potential problems that may indicate roof damage. Check for stains on the ceiling which may indicate leaks that need to be addressed. Homeowners with attics should enter their attics and look for signs of water damage, making note of any damp or wet insulation. This will let you know if water has been entering the attic all winter. Pay attention to the location of any wet spots or stains so you can match them up to the exterior of the roof later on. Musty smells also may be indicative of moisture problems, even if there are no visible leaks. Inspect the roof outside. Grab a set of binoculars and inspect the exterior of the roof. Look at the roof flashing, including around the chimney and other areas of protruding pipes and vents. If the flashing is warped or damaged, moisture might be settling underneath. Sealant around dormers or skylights can also degrade, resulting in leaks. Check for spalling on masonry, such as the mortar of chimneys. Porous areas will allow water to infiltrate. Have a professional roof inspection performed. If you are unsure if your roof has made it through the winter unscathed and would like a second opinion or if you find there is considerable damage, contact a roofing contractor. This person will offer a professional assessment of what can be repaired or if the roof should be replaced. If your roof is metal or features clay tiles, you may not have the expertise to make repairs yourself and will need to hire a professional.